Kendal is the principal town of South Lakes and is situated just outside the southern boundary of the Lake District National Park, only six miles from J36 and J37 of the M6 motorway. The town has a resident population of 29,495 (2011 Census) and is popular as a tourist destination, being ten miles south of Windermere and the gateway to the Lakes, which has recently gained World Heritage Status. The town has a catchment in excess of 50,000 people and a greater district catchment in excess of 102,000. The district’s class grouping indicates that in excess of 50% of the catchment area is A, B or C demographic. Oxenholme train station is situated on the West Coast main railway and is located four miles to the south, providing direct services to London, an approximate journey time of two hours, fifty minutes. Mintsfeet Trading Estate connects directly to the A6 Shap Road, providing a direct route south to Kendal town centre, and on to J36 of the M6, eight miles away. The A6 travels north to Shap and J39 of the M6, circa fifteen miles away. The site is situated at the junction of Shap Road (A6) and Mintsfeet Road, approximately half a mile to the north of Kendal town centre. The site is situated at the entrance to Mintsfeet Trading Estate, the principal industrial / business park in Kendal, where there is a mixture of warehouses, offices, car showrooms and trade counter properties, and occupiers include the likes of Screwfix, Howdens, Travis Perkins, building supplies companies, Suzuki and Vauxhall. As you travel north along Shap Road a new Sainsburys supermarket is being developed and a further car showroom occupied by both Ford and Land Rover. In addition, there are further industrial estates such as Lake District Business Park, as well as the South Lakes Retail Park where the likes of Morrisons, Halfords, Pets At Home and Next are located. The site extends to approximately half an acre and is currently being developed out by the tenants, Enterprise, as a car rental site. Enterprise have obtained planning consent for the redevelopment of the site, to include the demolition of the former car showroom, the erection of a purpose-built office building and the laying out of the site for parking for rental and customer vehicles. Enterprise are carrying out the whole of the redevelopment at their own cost with no financial assistance from the landlords, which clearly shows their commitment to the site. The development is due for completion July 2019. 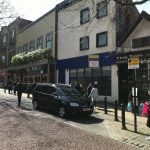 The property is let in its entirety to Enterprise Rent-A-Car Limited on the basis of a twenty year full repairing and insuring lease at an annual rent of £47,500 pa with effect from 23 January 2019. The tenants were granted an initial rent free period of 3 months. The rent is to be reviewed every five years of the term, collared at 1% and capped at 3% pa, based on the increase in the Retail Price Index. The tenants are to be granted a three month rent free period at the end of Year 4, commencement of Year 5, which will be reimbursed by the vendors. There is also a rolling break option exercisable after the end of Year 4 and running from the commencement of Year 5, subject to the tenants giving six months’ notice. Enterprise Rent-A-Car are one of the leading car hire / rental companies operating currently in the UK. They have Experian score of 85 and are considered to be low risk. For the year end 31 July 2017 the company had a turnover of just over £820 million, and a pre-tax profit of just over £9 million. We are instructed to seek a price of £725,000 subject to contract, which would show a purchaser a net initial yield of 6.22% allowing for normal purchaser’s costs.